All thermoelectric parts and components are avaliable to build thermoelctric generators from 50w , 100w, up to 1Kw. These are module designs that can be easily scaled to very large TEG Generator systems. Water sink and anodized aluminum plates are also available for purchase. All the parts necessary for a custom designed which are critical to design and build an efficient TEG Generator. The modules are only one TEG part that makes up a Thermoelectric power generator (TEG) appliance. It is imperative that the TEG designer move heat into the modules and rapidly away from the TEG modules on the cold side. Failure to do this will result in a thermal DAM (HEAT DAM). The dam or Thermal resistance will limit the TEG modules ability to produce power. So, in the case of a Air cooled Thermoelctric Generator requires extruded multi-fin heat sinks with the largest Thermal Conductivity ratings and Good fan CFM flow with low power draw. Dimensions of our TEG Heat sink is 5″(127mm) x 5.125″ (129.5mm) x 2 3/8″ high (61mm) with 32 serrated fins. Holes already machined for placement with our water sinks. Ideal assemblies for our Thermoelectric generator builds that require excellent force air cooling. High heat dissipating heat pipes with large condenser and evaporator foot prints fans for sale! Both muffin as in this picture and cross flow and 180° cross flow all available to build your own custom thermoelectric generator construction requirements (TEG). Power consumptions between (.5 to 1 watts). Low start up voltages, running voltages (5 V). 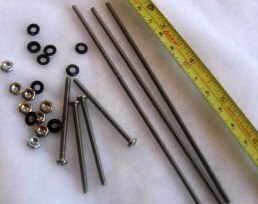 Recommended fasteners with Bellville washers are also available (all stainless steel).